Hey guys, it’s Mamma Biscuit and family and we’re back from a long break from blogging. So sorry for staying away for so long but we took a much needed rest from the digital world to get through the holidays and to welcome in the new year. So for starters, Happy New Year! I know, it’s quite odd saying that in the middle of February but I guess the phrase, “better late than never” seems serviceable with our greeting. What a fabulous year 2015 was and we hope to make 2016 even better as we continue to share Mamma Biscuit’s twilight years with you all who love her as much as we do. So much has been happening since our last post. We’ve been super busy cleaning and decluttering the Pug Palace to make it more spacious for our little gremlin who demands a spotless home the way she demands a soft-chew peanut butter treat. 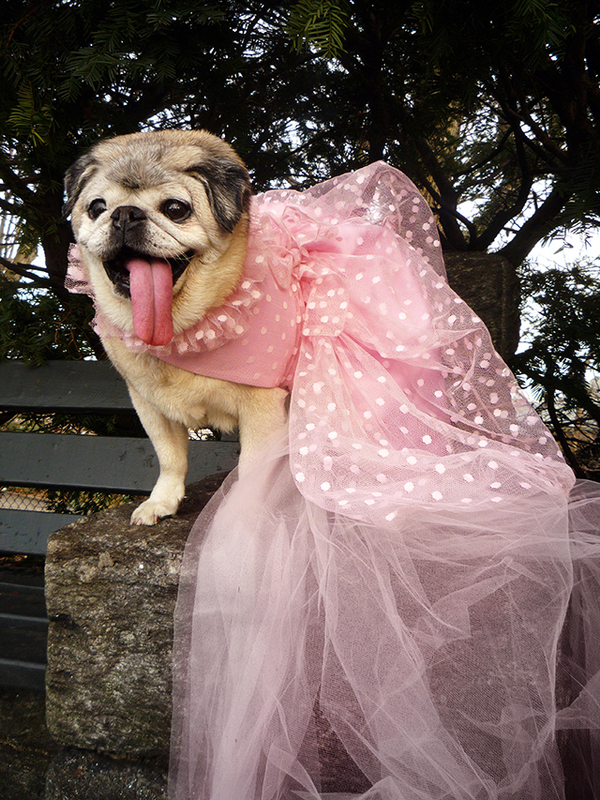 We’ve even gone through her extensive wardrobe and have shed many garments that no longer fit our pooch. She’s been growing a bit in her waistline lately and honestly, at 15 years old, she can be as big as she wants to be—she’s earned it baby! Now close to three weeks ago, New York City endured a record-breaking blizzard that seemed to disappear as quickly as it arrived. The snow was so intense and the winds were so blustery that even the idea of taking Mamma Biscuit outdoors for a photoshoot seemed almost dangerous. 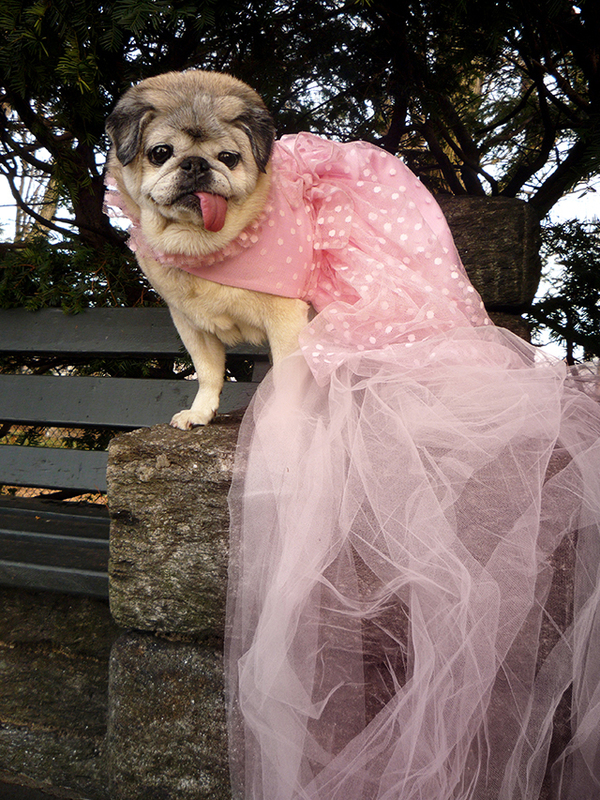 I was still disappointed that I could not document Mamma and her wagging tongue in 30 inches of snowfall but this fabulous pink dress you see here that our little spumoni face is wearing was an even bigger trade-off than photographing her in the park. Let me explain. Like the typical New Yorkers that Tommy and I are, we never went food shopping to prepare for such a storm. You can’t blame us though, we have a bodega in the lobby of our building and a mini mart directly across the street that stay open 24-hours a day. Even an earthquake followed by a tsunami wouldn’t make these owners close their establishments down so 30 inches of snow to a household that does not drink milk nor need bread to feel “safe” is a piece of cake—that would be vegan cake for Tommy. With that said, Mamma Biscuit’s food supply seemed to be low and since the snow was so intense and they weren’t making any deliveries either, off I went to the local pet store to stock up. I walked into the establishment and there were customers everywhere, grabbing as many cans of food they could possibly hold in their hands, clearing out the shelves as if the world was coming to an end! Everyone was in a frenzy except for me because all I could focus on was the fact that the pet store finally brought back their clothing merchandise and my eyes zoned in on this pink fabric folded up and slightly hidden under a pile of cable knit sweaters. I ran over to the shelf, literally pushing a woman and her kitty litter out of my way to lunge for the fabric. 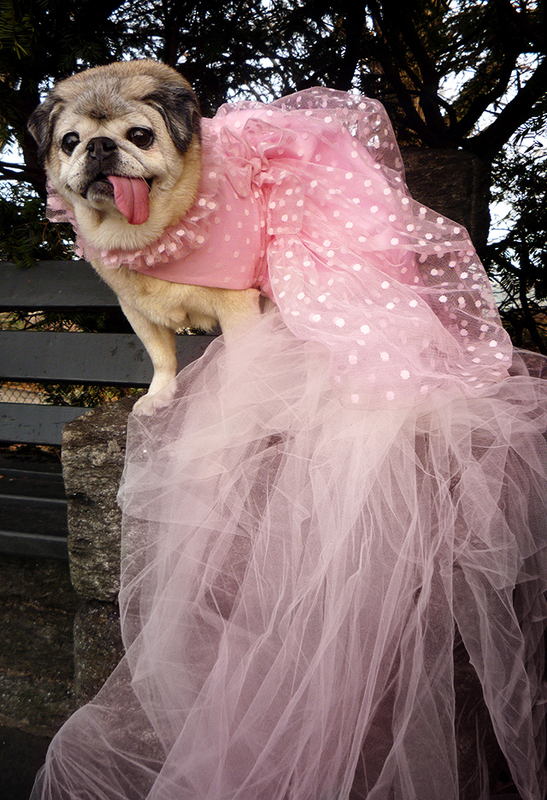 When I unfurled the dress, I suddenly realized that this was the exact dress I had seen several years ago that I never bought for Mamma Biscuit. For some reason, I was on the fence about it back then, probably because it was around 40 bucks and it lacked a bodice but now, it was 15 bucks and I was so excited that the garment made it’s way back to me that all I could do was march up to the register and pay for it. 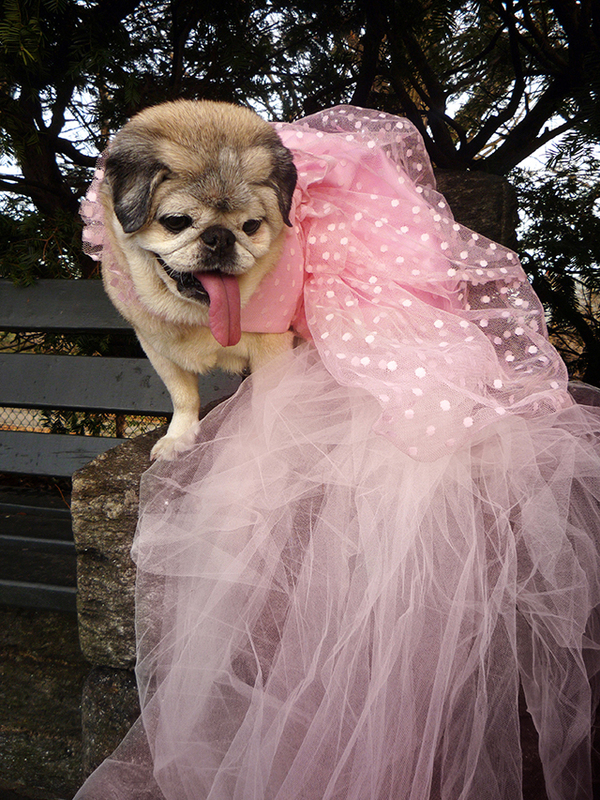 As I walked out of the pet store, proud and feeling accomplished with Mamma Biscuit’s new fabulous frock, I suddenly realized, having walked two blocks away from the store, that I never purchased Mamma’s food. Clearly, I have my priorities in order, especially during an emergency snow storm! Fashion first, food later! 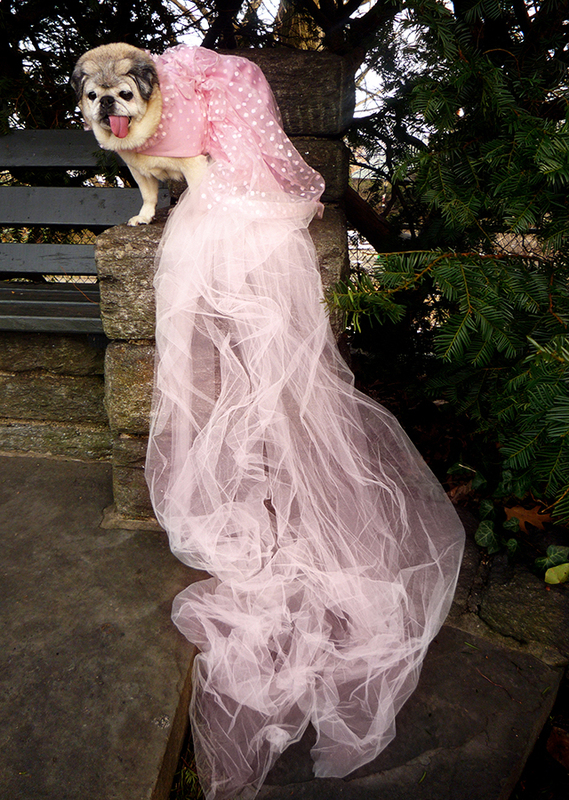 So that’s it folks, Mamma Biscuit is Pretty in Pink wishing you all a very dramatic Happy Valentine’s Day! 14 Responses to My Pink Valentine! She’s BEAUTIFUL! 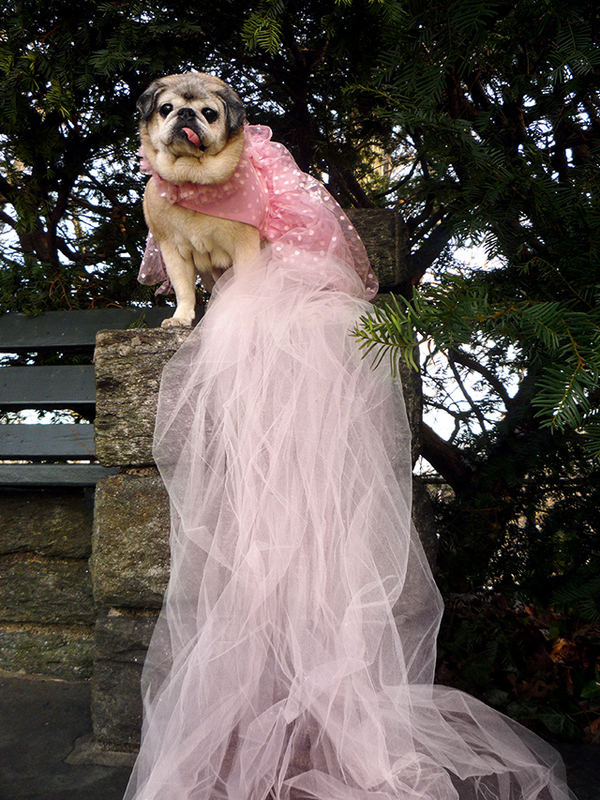 I mean, we all know that, but man… pugs look fabulous in warm colors, and maaaaan… She looks a little concerned about her perch. Maybe she’s figuring if her train will double as a cape, so she can glide to her daddies? Penny and Eddie went adventuring this weekend. Even mounted (with tape, so it really didn’t work as well as I would have hoped) a cheap old video camera to Penny’s stroller to record the event. Seemed like a good idea, but there’s a lot of video of people asking if they can take a picture of her… which is flattering, but not compelling viewing. 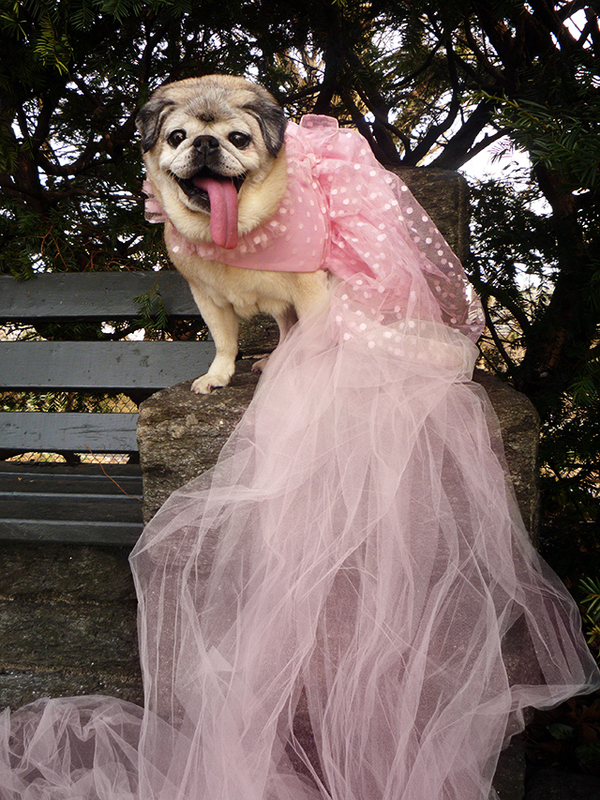 Much better to have third person pug photos. Glad you survived the storm and it faded quickly… We’re in Boston and the 8 feet in three weeks thing that happened last year sucked so much. There was NOWHERE to pee. Penny was trying desperately to lick it all away. (Does Mamma do that? Lick snowbanks like she’s single handedly going to put the DPW out of work?) I will never look askance at Buffalo again, I tell you. Not over that anyway. 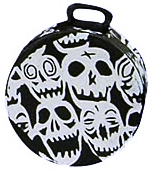 Thank you Gwen and welcome aboard to Mamma’s little corner on the web! Mamma is soooo beautiful! And age 15?! No bleeping way! lol Her dress sure is something! Love it! I can just see her sitting on her throne, sipping a glass of bubbly and asking her servants (daddies) where’s my tiara??! LOL Our little gremlin always seems to be asking where her tiara is, and her peanut butter treats. 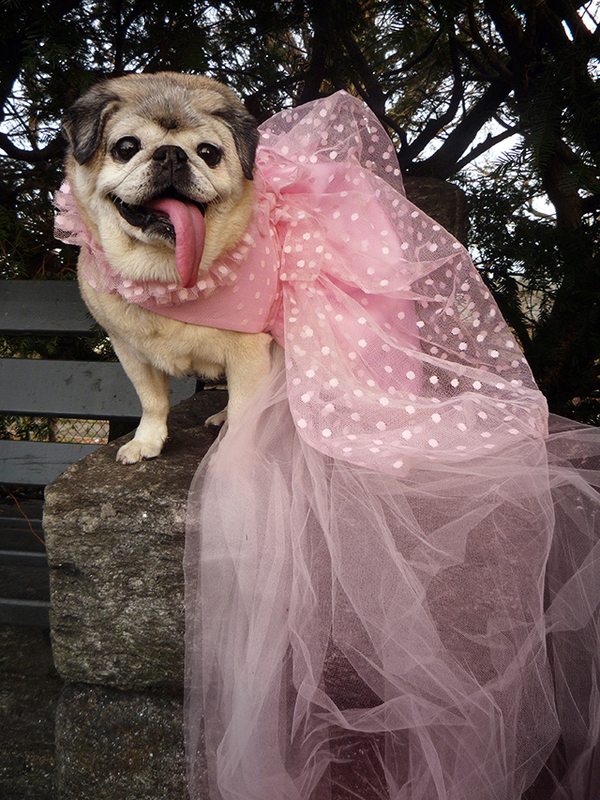 In fact, her tiara is made of peanut butter treats! Thank goodness they are shellacked into place! We hope you had a fantastic Valentine’s Day! MB has to be one of the best dressed beings in ALL of NYC!! Thanks for the lovely comment Sarah and welcome aboard to Mamma’s little corner on the web. I too believe that food is a non essential top[ic when it comes to canine fashion and Mamma Biscuit! Hi Mama! I’ve been following your exploits and that of your humans since Tommy starting sending me links to your Christmas decorations (I’m another holiday decoration addict). Please tell him that I’m missing him and hope he emails me when he gets a minute. Welcome aboard Beth. Thanks for following Mamma Biscuit all along. I’ll let Tommy know to email you when he has a moment! 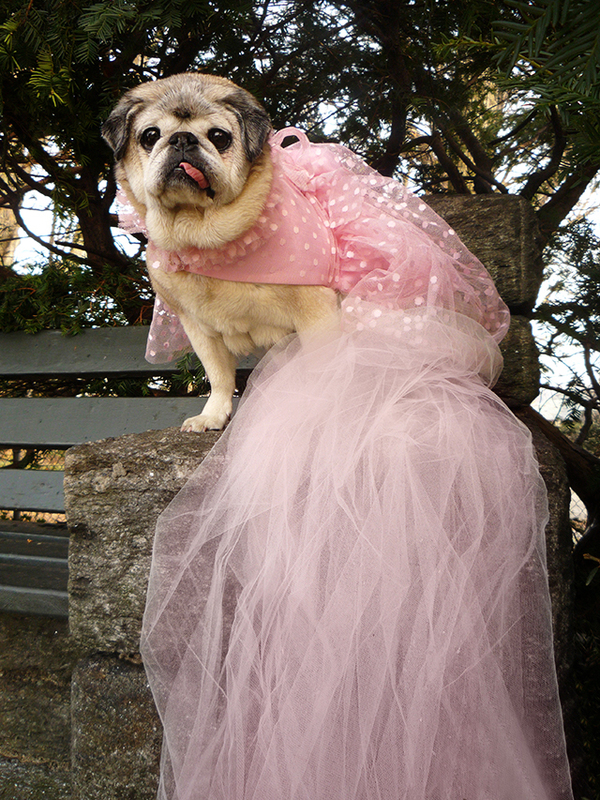 Mamma B looks just like a princess in a fairy tale in her beautiful gown. Hope everyone has been well. AWWWW thanks so much for the note guys! Pug hugs and kisses to you all as well!